Interesting fact: Kremlin (Кремль) means fortress in Russian and most old cities have one. Moscow's is just the most famous. Maybe I'm just saying this because Moscow is my current home, but it is one of, if not the, most interesting big cities I've even been to. Often, especially in the media, Moscow (and Russia) is portrayed as scary and/or dangerous. It is not. I have been here for nearly two years and have never felt in danger. Even noticeably less than when I lived in New York. The some goes with the people. Bottom line, visit Moscow and don't be afraid. Even though they're a bit touristy, see Red Square and the Kremlin. Go for a stroll or bike ride in a few of the parks, take a walk down Tverskaya at night and see it all lit up, and haggle with a vendor at Izmailovsky. But most of all, and I know I say this a lot, go around and explore as much as possible. Moscow is a huge city and every area has its own unique character. You'll find something interesting anywhere you go. But I recommend learning a few phrases or familiarizing yourself with the Cyrillic alphabet before you go. English is still not that widely spoken and most of the metro stations are only in Russian. WARNING: Some of the cops and security guards are dicks. Occasionally you're be better off asking regular people if you need help. After two years of living in the cit, I compiled a list of the best things to do in the city. This is completely an arbitrary list base upon my personal preferences, so although some things here will be standard tourists attractions, others will be a reflection of my own bizarre tastes because they are in the order of how much I enjoyed each experience. Therefore things like Гум (as shopping centers usually make me break out in hives) are left off the list. That said, here are my top 11 things to do and see in Moscow (since 10 in an overrated number). It is my firm belief that the best way to get to know a culture is through food and drink, and although Russia is not known for it's cusine, I must admid I've grown to really enjoy eating blini for breakfast (and sometimes lunch and dinner). Blini are similar to crepes, but slightly thicker and, in my opinion, better. An interesting thing about them is that you can get them either with sweet of savory filling anywhere they're sold. So basically, if you want one with berries and jam or with sweetened condensed milk for breakfast, you can. And if you want one with cheese and mushrooms or smoked salmon for lunch, you also can. My point is, you have a pretty diverse variety to choose from and as long as it's not from a chain restaurant, it'll be delicious. My best advice would be, if possible, to go during a week in early spring called (Maselnitsa). It's a 7 day celebration before the beginning of Lent in the Russian Orthodox Church that consists of eating as much blini as you can. You'll find stands selling them in pretty much every park, Red Square, and other major areas of the city. Normally, I hate shopping. My general outlook is that more material possessions just collect dust and weigh you down. But, that said, whenever I did go buy something in Moscow (aside from food), it was always at Izmailovsky Market. For me, this wasn't just a place to go buy something, it was quite literally an experience to be had, and here's why. First of all, it's the largest open air bazaar in Moscow and consists of hundreds of stands, set up by locals, where you can get pretty much anything you can imagine. Old Soviet memorabilia? Yes. Household appliances? Yes. Paintings and artwork? Yes. Homemade honey and alcohol? Yes. Central Asian scarves, Russian hats, and hand-carved chess sets? Yes. If you do want to get a gift for a friend or relative, this is absolutely the place to go. Everything will be so much more interesting than in stores and much cheaper if you know how to haggle. Even if you don't want to buy anything (as was usually the case for me), it's still fun to go browse around and practice speaking Russian with the local vendors. Oh yeah, and one more thing. The market is located within Moscow's second Kremlin. Many people don't know it, but the city actually has two Kremlins, the huge stone one in Red Square that now serves as Putin's house, and this smaller, colorful wooden one that serves as a market. It is near the metro station Partizanskaya (one of the last stops on the dark blue line) and is quite far away from the hustle of city center, and it exists because this region (Izmailovo) used to be a city in and of itself. Is Russian, Kremlin just means stronghold, and this wooden Kremlin used to be the fort for defending Izmailovo before the region was eventually absorbed by Moscow. This one is a bit of a personal favorite. It is not one of the city's most famous monuments, nor will you ever see it in a guide book or tourist information pamphlet. Before going there, I never had any idea that it even existed, but finally one day I came across it by chance. It all happened as I exited the Leninsky Prospekt metro station on my way to Vorobrovny Goriy. To my surprise, I was greeted by this giant silver figure (looking a bit like Superman) standing on a pedestal, posing as if he were about to fly off into the sky. 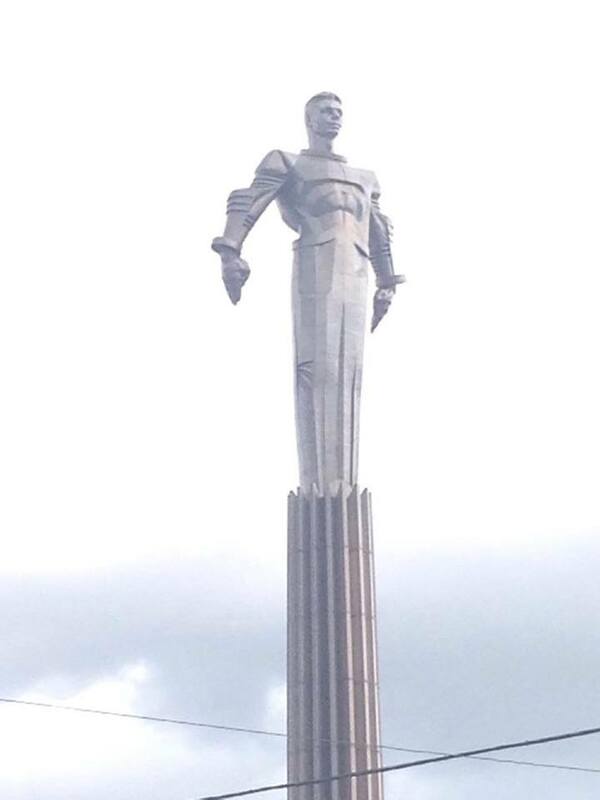 It was constructed in Soviet-era block form, made to look as glorious as possible. I was intrigued. It wasn't until I walked closer and actually read the inscription until I actually found out what it was: a monument to the first man in space, Yuri Gagarin. For me, it felt like my own little discovery, unknown to foreigners and away from the busy center and for that reason, it makes my list. It was both weird and awesome. It by no means fit in with the surrounding landscape, but after knowing Moscow for two years, it makes complete sense. Its an odd and unique relic of the Soviet past, and if you're at all like me, you should absolutely go check it out. Have you ever wanted to see the preserved remains of an early 20th century communist revolutionary? Well, if you come to Red Square and wait in line from 10:00am-1:00pm (once in a while it's closed for repairs), you actually can. There's a big building that reads (Lenin) and is free to enter. From there, you will be greeted by several guards demanding that you keep quiet and do not take photos. Then, after walking down a couple corridors, you see him. Leader of the Bolshevik October Revolution (which actually started in November), Vladimir Ilyaich Ulyanov (aka Lenin) lays, preserved in a glass coffin and surrounded by dimly lit red lights. The whole experience is a bit eerie, but overall,one thing in particular stood out to me. Lenin was short. Very short. Probably no more than 5'5'' or 5'6'' which came to me as a surprise since I'd always imagined him as this powerful, towering figure. Apparently he was not. But that said, it's absolutely worth checking out. One of my favorite Russian novels is The Master and Margarita, and if you're familiar with it, you'll understand why this place is on my list. Not only dose it serve as the opening scene for the story, but the former house (now converted into a museum) of its author, Mikhail Bulgakov, sits right alongside with a perfect view overlooking the water. And also little subtleties referring to the novel, such as Кафе Бехемот (Cafe Behemot) (named after the giant demonic talking cat in the story), can be found here and there, scattered around the area. Regardless of the novel, the whole area is a beautiful spot in the city. Green trees and pleasant walkways line the still waters and many little benches sit in the shade if you to relax and enjoy the day. Also, there happens to be a large variety of strange, yet interesting statues depicting animals acting like humans have been constructed all around the perimeter of the place, which in and of itself is worth seeing. Just one side note though, the name is a bit of a misnomer. Despite the plural name, there is only one pond. Still, it's really nice and worth a visit. I know this is probably number one on pretty much any tourist site, but it absolutely is one of those places you need to see. I still remember the very first time I walked through the gates and saw St. Basil's and the Kremlin standing before me in all their colorful glory. It felt unreal, as if I had walked onto a movie set. None of the pictures I'd seen before had done it justice. The whole scale of it, all the colors and history surrounding me was an experience unlike any other. Lenin, revolutionary leaders, Soviet premiers were all buried right there along the walls of the massive Kremlin with its towers bearing down upon you. And I can say, if you have a full day, make sure to go in. Over 75% of the Kremlin is open to the public and you'll have the opportunity to see the Tsars' armory and throne room, among thousands of other artifacts from Russian history. Also, make sure to check if there will be any type of cultural event going on during your stay. Many different demonstrations, parades, exhibitions and festivities are held within the square and are open to the public. Moscow usually goes all out making the special occasions as grand as possible. Therefore, it could make for a really interesting experience if you get the chance to attend some sort of celebration or display. Winter in Moscow is best defined by two adjectives: cold and long. Sometimes it feels like it lasts from October to May and tempertures can fall below -30. But, to the city's credit, Moscow is pretty well prepared for such conditions and no place, in my opinion at least, does it better than the area around Pushkin Square and Tverskaya Street. From the begining of December to the start of February, the whole area is lit up in decorations and lights. The barren trees glow with lively white lights and festive decorations hang from every lamp post. It's always slightly different each year, as Moscow is a dynamic, changing city, but always is a beautiful sight to see, especially in the snow. If you're there in the winter, make sure to talk a walk around at night. Believe me, despite the cold, it is very much worth it. Growing up between New York and Boston, I was used to subway/metro systems being rather dirty and terrible. However, when I first entered Moscow's, I was completely blown away. As well as being several stories underground, the stations were completely spotless, decorated with chandeliers, murals, and statues, and incredibly efficient. 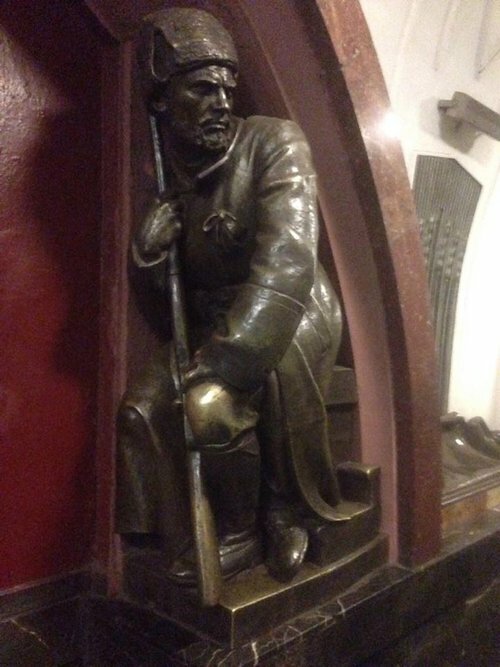 Every station was unique in its own way, with different designs and decorations (most commemorating some part of Russian culture or history), and since there are 14 lines with 20-30 stops each, the sheer magnitude is mind-blowing. One day, a few friends and I decided to make an adventure/photo project out of it by travelling to some of the most interesting and elaborate stations throughout the city and taking pictures of what we saw. Even though I knew it would be interesting, at the very least, it ended up becoming one of the best activities I've done since moving there. We went during a weekday in the evening, after rush hour, so there weren't too many people around, therefore giving us the ability to see much of what is missed during the standard commute. I couldn't recommend this enough. By doing a self-constructed metro tour, you can see all the subtleties that went into creating and engineering the whole underground system. I advise seeing as many stations as you can, but as for some recommendations, make sure to see Комсомолская/Komsomolskaya, Маяковская/Mayakovskaya, Пло́щадь Револю́ции/Ploshad Revolutsiy, Киевская/Kievskaya, Белопусская/Beloruskaya, Арбатская/Arbatskaya and Проспект Мира/Prospeky Mira among others. This took me a while to find when I first arrived. Most bars in Moscow just have DJs and do electronic music, which is mediocre at best. But when there is such a lack of creativity on the surface, you often find something amazing crawling beneath. For me, this happened when a Balkan-style brass band (although formed in St. Petersburg) came and stayed at the hostel where I was currently living. They were friends with the manager and apparently pay a visit every time they come to town to play a show. I thought 'Why Not?' and decided to go see what they were all about... and that's when my whole perspective on Russian music changed forever. Not only was the show unbelievably lively and fun, but the music was incredible. It was like a whole new world opened up for me. From that point on, I began to dig deeper and discover other bands that flourished outside the mainstream spotlight and the discrete underground bars in which they performed. There was an entire thriving sub culture thriving just below the surface where people danced on tables, played electric fiddles with their teeth and celebrated the night in all its glory. While venues and bands do change on a weekly basis, a few reliable places to check out would be Dzhao Da, Сады Вавилона /ardens of Babylon, Smena Bar, and Shirokuyu Na Shirokuyu, among others. Two of my favorite band discoveries so far have been Карл Хламкин/Karl Hlamkin and Добраночь/Dobtanotch, which I have written about pretty extensively in the section about underground music on the Moscow page. You know that place in your town that you consider 'your place'? The place you go when you want to unwind, escape the stresses of everyday life, or just to be at peace by yourself. For me in Moscow, that place is Kolomenskoye Park. And while it's only one of Moscow's many huge green-space areas, this one stands out above all for me for a couple of reasons. First of all, it's huge. If you're deep in the thick of it, it really doesn't feel like you're in a city any more. Instead of buildings, the landscape becomes hills, grass, trees, and old wooden buildings which all come down to the bank of the Moskva River. The view is gorgeous all year round, but that isn't the ultimate feature that makes the park stand out. What separates Kolomenskoye from the rest of the parks is, instead all the unique features and quirks it contains. For starters, there's a full apple orchard in the middle of the park. I kid you not, thousands of trees stand in rows and from mid summer to late autumn, you can go pick some whenever you want. And they're good too. My friends and I actually used them to make a pie which, despite my lack of cooking skill, still turned out delicious. Then, for drinks, vendors often serve (mead) or mulled wine which is heated and served warm during the winters, thus helping you bear the cold. The whole place looks out of time, and that is largely helped by the array of wooden buildings scattered throughout the park. Most famously, there's a 15th century wooden church overlooking the river surrounded by mini cabins, but if you continue down the path, you'll soon come to old stable houses and eventually an ornate wooden palace built for the Tsar's family that is now attached to a small, cozy cafe. You can sit outside and look out over the hills and valleys as you eat Vareniki (Russian dumplings) and drink mead. What's more wonderful than that? If you make close friends in Russia, there's a good chance you'll be invited over for food and drinks. Although it is unlikely that this will happen if you're just coming for a quick tourist visit (unless you know someone beforehand) please jump at the chance to join if you get the chance. House parties and get-togethers are a central part of Russian social life and, if I'm being honest, they have been my absolute favorite part of living in Moscow and helped me feel as if I had become a part of the society. Here's what they're like. Unlike most of Europe, Russian social/drinking life takes place more within private residence alongside close friends and family as opposed to strangers at bars. Usually, the way these events go are like this. One person will invite everyone over and prepare home cooked food and drinks. The food part is particularly important too because according to Russian cultural norms, alcohol is never served alone and every drink is supposed to be followed by a bite of something (preferably cooked warm). On top of this, each guest is supposed to bring something like snacks or a bottle of wine. Even though the host will put forth a great deal of effort and prepare as much as they can for everyone, it is seen as disrespectful to show up empty handed. Once everyone is there, food and drinks are placed out on the table for everyone, someone will give a toast, and then the festivities begin. By this point, everything becomes pretty relaxed and informal, people will dive deep into group conversation, and usually a game will begin. Most commonly (at least in my experience) the first game to start is the one where you write someone's name on a piece of paper, exchange yours with someone else, and then stick it to your forehead. The objective is to be the first to guess who you are using only yes/no questions. This will continue well into the night, as will the food and drinks, until the last person leaves. For me, it was a great way to feel welcomed into my new home country and really helped develope strong friendships and helped me see Russian culture up close. There was never a dull night when we were all together and to this day have been some of the most genuine experiences I've had anywhere. One day, a few friends and I decided to make an adventure/photo project out of it by traveling to some of the most interesting and elaborate stations throughout the city and taking pictures of what we saw. Even though I knew it would be interesting, at the very least, it ended up becoming one of the best activities I've done since moving there. We went during a weekday in the evening, after rush hour, so there weren't too many people around, therefore giving us the ability to see much of what is missed during the standard commute. It was an early September day when I first came across these to sites. Just a day before, I didn't even know they existed, but a local friend, Anya, suggested we meet up there for the day. She told me to look for the statue of a rocket going into the sky and said that is where I'd find her. Not knowing if it would be something difficult to spot, I agreed and hoped out for the best. As it turned out, there wasn't so much difficulty. Away from the busy center and urban sky scrapers, the Cosmonaut Exhibition stands in a large, open area. Alongside the giant structure imaged above, there are several other features, including head busts of the first man (Yuri Gagarin) and woman (Valentina Tereschkova) in space. Even some of the space shuttles that went into orbit can actually be seen at the base of the statue complex. Plus all of this is above the Cosmonaut Museum, which is regularly open to the public and features a very important time in Soviet History. Anyway, that informational tangent aside, Anya and I didn't go into the museum that day. Instead we walked past the exhibition to the giant park behind it. Named ВДНХ (also located at the appropriately named ВДНХ metro stop), the park greeted us with a large, granduous columned gateway. Inside, everything was incredibly lively. Small food shops and well maintained gardens lined the walkway as numerous exhibitions were taking place. One in particular involved a large group of people putting together a house mad out of cardboard. It got our attention, so naturally we got involved. Alongside that, there were tons of monuments and fountains dating back from the Soviet era, each being a tribute to one of the republics. The park continued to stretch back, with more stages for performances and monuments here and there, but eventually they stopped and the parked turned into a forest with pathways and trails. Human construction stopped and nature took over. I later went on to visit the place throughout the year, and whatever the season, there was always something going on. Personally, now, I recommend winter because they open up a large ice skating rink in the center that's open for the public. When I travel or live some place new, one of my favorite ways to experience and immerse myself in the culture is to find and go see local music. However, when I first moved to Moscow in 2015, this became a bit of a problem. Although I was already aware that Moscow (and Russia in general) is not well known for having a great music scene, it seemed nearly impossible to find good venues that had something other than electronic music or generic pop. Throughout the weekdays, I would scour the internet, looking for something interesting and unique, but every place recommended, particularly the expat bars, was more generic than the last. However, once I started making local friends and getting the inside word, things started to change. Drastically. I still remember one day complaining about this to one of my Russian friends, saying that the whole city seemed to be void of descent music. I must have come across as if I were in a state of despair because she quickly responded, “You just haven’t been here long enough. Come with me this weekend and I’ll show you what Moscow’s music is really like.” Semi-hopeful, I agreed. The band was named after its lead singer, Karl Hlamkin, and the location was called Сады Вавилона (Gardens of Babylon), a small bar tucked away in an alcove near Тверская улица (Tverskaya Street). As we approached, the walkway was dark and fairly deserted to the point where I began to wonder if we had the directions right. But then I began to hear something. It sounded like some type of brass horn, maybe a trumpet, and it grew louder and louder. Then came a booming raspy voice, full of energetic intensity. Excited, I pushed open the door, not quite sure what would be on the other side. I stepped in. Suddenly, my entire surroundings came to life. In front of me stood a room full of people, drinks in hand and dancing their hearts out. But the people weren't the center of attention. That glory belonged to the band on stage. They had a certain style and form of showmanship that would never be found in one of the ex-pat bars, and were equipped with powerful brass horns to back it all up. Two bearded skinny guys, one with a trumpet and the other with a saxophone, stood on the edges of the stage while a drummer, a bassist, and a girl with short, dark hair, holding maracas, performed with a joyous, edgy intensity. Then, of course, there was the lead singer: Карл Хламкин/Karl Hlamkin. He was by far the oldest in the group, singing with a deep voice, wearing a winter cap, gray stubble, cigarette in mouth and a shirt with a face that resembled Jack Skeleton from Nightmare Before Christmas. He was giving the energy and performance everyone came to see. There was nothing to prove, the room was already his. He knew it, and he delivered. From this point, my perception on Moscow music did a complete 180. I started hearing about punk bands at Китайский Летчик (Kitaisky Letchik), ska bands at Сады Вавилона (Gardens of Babylon), grunge bands at Smena Bar and recently just saw a Balkan-style brass band called Dobranotch at a Serbian bar. Moscow is crawling with good music, you just need to take the initiative to ask around find it. Maybe it will in back alleys or quite literally underground in some discreet bar. The styles and performances can be different, but everything I saw from then on shared this energy and apparent passion for the music they were making and performance they were giving. Each one of these bands seemed so creative and seemingly spontaneous to the point where I felt as if they were getting a read from the crowd and playing accordingly. It is hard to pinpoint the specific reason. Maybe it's because the main stream music scene is that bad, the counterculture backlash so genuine and exciting. Whatever the reason, however, Moscow's underground music is absolutely one of the secret gems of the city. Anyway, hare are a few of my favorite finds so far. Please enjoy! It is really hard for me to write a post about Vagabond Hostel (currently on about my 10th attempt) and frame it in a way that truly reflects the impression it made upon me. I do not mean to sound cheesy, but to me, Vagabond was not just a hostel, but my home and my community. I felt more welcome there than literally anywhere I've visited or lived since leaving home for college. And considering all the flats, rooms, guesthouses, and other hostels, this is pretty substantial. To be honest, the first thing that drew me to Vagabond was the name. It sounded like a stopping place for wanderers from around the world, so I initially made a booking for five days. I thought this would be good and give me a chance to either stay if I liked it, or go find a new hostel if I didn't. I stayed... for over five months. I am not sure how it happens, but somehow Vagabond always seems to attract the most amazing and interesting people through its doors. Maybe it's the staff. First off there's a slender curly-haired guy named Nikita, who is always down for helping you learn Russian and cooks the most wonderful breakfasts. Then there's a blond girl with an asymetrical haircut named Yulia who can make you laugh until it hurts, and Roman the bearded and tattooed artist. Needless to say, this crew soon became my closest friends in the city. And then there is Robert, the owner and founder of Vagabond. If anyone deserves the credit here, it's definitely him. This haven for wanderers, artists, musicians, and locals looking to escape the hustle of the big city was Roberts dream and he tirelessly works to improve on his already amazing creation by bringing in weekly free concerts, daily free breakfasts, hostel dinners, and birthday celebrations if there happens to be one. And on top of all that, it was the creative environment at Vagabond that compelled me to create this blog in the first place. So, Vagabond will always have a close place to me. There is an ongoing debate in Russia over which is a better city, Moscow or Petersburg. 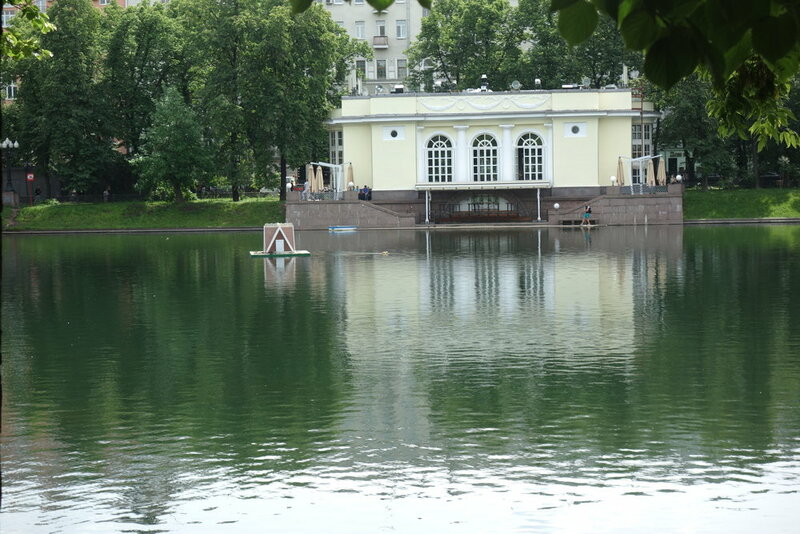 People often go back an forth, but in one category, Moscow absolutely reigns supreme: Parks. Moscow's parks are enormous and numerous. They are so vast that when in ones like Kolomenskoye, Tsaritsino, Sokolniki and Izmailovski, you can no longer tell you're in a big city anymore. Unfortunately, the park that gets the most attention, Gorky Park, is in my opinion, the least exciting. It's not that Gorky Park is bad or not worth visiting, but the other parks are so much nicer. Gorky is kind of generic and filled with tourists, like parks in most big cities. You can see buildings and there are vendors everywhere. Compare that to Tsaritsino. Here there are hills and valleys as lush and green as the open country. There are trees everywhere you look, along with fountains, lakes, and most notably, an old palace. Right in the middle of everything sits an old palace that has been converted into a museum. It is awesome, and I highly recommend going there to anyone. There is no city feel here, and it is so big and open, you feel like you're going on an adventure with every section of the park you explore. And this is just one of them. Each park has its own character and personality. I could explain more, but I'll let the pictures above do the talking. (click to go through and see all of them). Usually I do not like touristy areas in a city, often finding them loud, tacky and overpriced. Red Square, however, despite being the most heavily touristed area in the city, is still definitely worth a visit. I still remember the first time I walked there, looked around and felt like I had just stepped into a fantasy movie set. St Basil's Cathedral with its vibrant colors and onion domes in front of me, the giant red archway behind, and Lenin's Tomb and the big Kremlin clock tower to my right all looming much more impressively than I could have imagined. And, best of all, pretty much everything, including about 80% of the Kremlin is open to the public. As an American, this all felt a bit unreal. Thirty years ago, I wouldn't have been able to enter the country, but now, I was walking around in their equivalent to the White House (only 600 years older and about 10 mines bigger). Most of it is actually a museum, and what it holds is pretty amazing to see. All the thrones and outfits of the Tsars are on display, which of course I went to first, and was amazed just how big Peter the Great (Пётер I) must have been (estimates are close to 7 feet) and just how tiny Ivan the Terrible must have been (probably 5'4'' or 5'5'' judging by the uniforms). Have you ever felt the urge of seeing a taxidermodied communist revolutionary from the early 1900s? If so, you and I were thinking the same. And thankfully, Moscow offers you this opportunity (from 10:00am to 1:00pm most days). When I has first arrived, Lenin was temporarily closed for a few months for repairs, leaving me to assume his arm fell off or something like that. Either way, it meant I had to wait. But then, one day in early November, I noticed something. A line of people was starting to form in Red Square next to the building labled ЛЕНИН (Lenin). Could this be my chance? I did not hesitate and ran to the line, and to my pleasant surprise, it started moving, and within twenty minutes I was at the front. As I walked towards the entrance, I looked to my right and saw the graves of many former Soviet leaders from Stalin to Brezhnev, Revolutionary leaders, and even to Americans, John Reed and William Haywood. This was it. Russian history of the 20th century lying under my feet. Then I walked through the doors. Right in the entranceway stood a guard. "Shhhhhhhhhh!" he said rather loudly, beckoning me, and everyone else, to be quiet. I obliged, then headed down a long, dimlymlit corridor, past another guard, and then reached a large room emminating a reddish glow. Now I know, this was it! Vladimir Ilyaich Ulyanov was just a few steps away. I walked I walked in, and there, in the center of the room, lay a glass casket, and in it a man. He was bald with a whispy light brown beard. his eyes were closed and his body seemed a bit waxy (although that could have been just from the red lighting of the room. But one thing stood out more than anything, he was short. And I mean really short. 5'5'' (165cm). In my mind, he had always been this powerful, towering figure, but here, he was just a little fella. Interesting. I guess people really were smaller back in the day. When I first began, I had absolutely no idea what to expect. I had never thought an actual class before back in the US, let alone another country, and my first class was to be just a week after I landed. I had no idea if my student's would listen or understand. I did not know how their comprehension of English would be, I didn't know if I would be able to keep control of the class, and I had no clue whether it would be enjoyable or a disaster. It seemed almost too much to take in, and it was hard to get the thought of "what am I doing here?" out of my head. That was two years ago. It was not a disaster. And looking back, I realize that working in Russia as a teacher (first with kids aged 9-18 and later with adults) has had a substantial effect on my time in the country, and myself overall as a person. It's hard to summarize all the classes and all the experiences into a few concise paragraphs and then draw out meaningful conclusions for you the reader, but here goes! The first thing that struck me was just how intellectually curious some of my students were. For example, I had a class of twelve and thirteen year olds who were so interested to to learn about the American educational system, about who I was as a person, and my perceptions of life in Russia. I went in expecting just to teach the language, and ended up involving myself in culture sharing discussions, which helped us bond in ways I know would have been impossible had I stayed in the US. It kind of broke down the barrier between teacher and student and I actually got to learn a little about who they were as people, which made the act of teaching infinitely more fun. As the year went on, I began including more and more open discussions and, I don't mean to sound cheesy here, were among the most rewarding parts of the whole job. I mean, I got to moderate a debate between groups of seventeens as they went back and forth over the benefits and drawbacks of globalization, and I got to listen to a twelve year old explain, in perfect English, how she hoped to work as a clothing designer for homeless and poor people with the hope of improving their livelihood as much as possible. I even enjoyed working on Saturdays (yes, I had to work Saturdays. Damn management!) for these kids. It turned out my two favorite classes were Saturday morning and no matter how hungover or how bad of a mood I was going into work, they would always put a smile on my face and have me laughing within five minutes. Unfortunately, all good things had to come to an end, and I had no idea how sad it was going to be to say goodbye. But on my exit, I promised to return, which I did during the winter of the following year.I would describe the occasion, but the pictures below show how that went better than words. The card they made me. It is awesome! This was right when I entered the door, Hence the coat. After my first year was complete, I ended up leaving my first job at English First and chose to work for a tutoring agency instead of a proper school. I enjoyed teaching (most of) my classes the previous year, but I wanted a change from the regimented 8-9 hour work day as well as a little more freedom to develop myself as a teacher. The school had be teach lessons solely out of a book and give regular exams. This way, I would be more like a freelance tutor, teaching classes periodically throughout the day with gaps in the day to do as I please, so I decided to give it a try. Naturally, as there is with everything, there were a fair share of pluses and minuses with the transition. On the bright side, I got what I was looking for: more freedom and a flexible schedule. For example, one work day could be classes from 10:00-12:00, 4:00-5:30, and 6:30-8:00. Each would be in different locations, which did help me explore much more of the city, and the time in between was mine to do as I pleased, which definitely helped me develop more of a social life and take part in much more that the city had to offer. I also have to admit, it was significantly easier teaching adults than kids (for the most part). I never had to worry about discipline, and I could now teach most of the lesson through conversation, whereas last year I had to do regimented activities and exercises. These features were all better, but there were several drawbacks, and the main one, to me, would be that adults are generally far less fun than kids. Yeah, I didn't have to yell at anyone to be quiet and pay attention, nor did I ever feel like I was about to pull my hair out from stress, but there were significantly less times in which I laughed and left a class with a huge smile on my face. And, looking back, this all gave me much more of an appreciation of just how creative kids can be, and depresses me a little bit on how many people lose it. That said, I'm definitely glad I had both experiences. It would be hard to choose which one was better since they were both so different. I guess the best summary I can give would be this: teaching kids definitely has higher highs and lower lows. Adults are pretty much always in the middle. But between the two lifestyles, living as the freelance tutor definitely beats the regimented work schedule. That I can say for certain.